The mini downhill series is now in it’s 10th year. 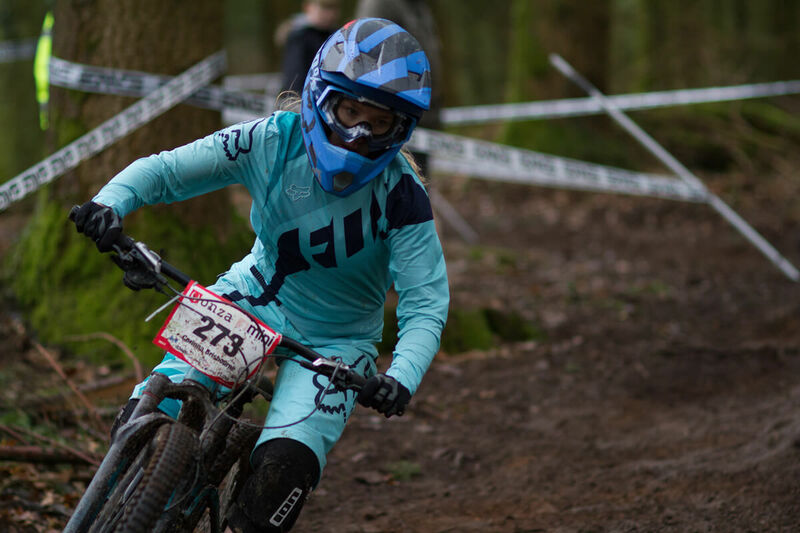 On a wet Sunday morning in February on a track slippery enough to test any rider Corinna joined 19 other women entered across 4 race categories, here’s her race report. Setting off early on Saturday to get to the Forest of Dean for the latest race in the winter series, round 3. When I have got a race organised for the weekend nothing gets me more excited, packing my kit (plenty of waterproofs and base layers), I was ready for the upcoming wet, muddy weekend. I had a fun filled Saturday made up of finally meeting my team mates, having a photo shoot and checking out the mess that was to be; the race track. Started out by riding corkscrew and collecting some immense photos of us girls riding, definitely weird to be riding with a group of ladies but so nice and relaxed. Spent a good couple of hours up riding the track and getting to know everyone! Moving on… after lunch I decided to set out and have an attempt at riding the race track, walking up the track I saw 1 out of every 3 riders coming off which wasn’t the most confidence building but did make me think about which line would be best suited to me, that I could make myself go fastest on without coming off. I spent most of my time watching rather than riding, trying to work out where exactly to go. Once the heavy rain had started later on in the afternoon, I called it and decided to go and get some rest. Race day… waking up to a cloudy, cold morning which was expected. The rain had come over in the night making it just that more difficult to get down the track, rubber side down. I headed up and made one practice run before going up again at 11.00am to complete my first race run. My first race run felt slow, and towards the middle of the track I came off into the boggy mud to the side meaning I had to put the bike back on the track and carry on as quickly as I could (not the best), got to the bottom with a 1 min 51 sec run. Here we go again, second race run soon came round… tried my hardest to try and keep some speed although I felt slow and cautious through the middle trying to avoid coming off again. Bit wobbly down the bottom through the last corners (going off line) but put together a much better run that my first getting 1 min 38 sec. Sadly as my category only consisted of 2 riders, I came second but I was happy with how I did. A wet weekend but a rad one for sure!